When it comes to cooking with oils we have plenty of options to choose from, but do we necessarily know what the best and healthiest oils are for roasting, frying and drizzling? Just over a month ago, I asked the question below on Twitter and Instagram as I was really curious to know what other people use. For the option of other, I received a range of answers from avocado oil to canola oil, rapeseed oil and even butter. 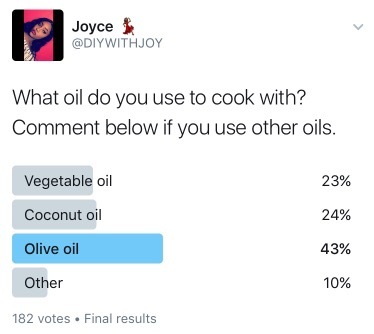 I was quite surprised by the outcome of the poll and thought I’ll share a guide for choosing the best cooking oils. This is the temperature at which an oil starts to burn and smoke. Knowing the smoke point of oils is important because heating oil to the point where the oil begins to smoke also produces toxic fumes and harmful free radicals. Understanding the basic components of different cooking oils can help you to make the right choices and will be overall beneficial to your own health. Trans fats: They are found mostly in foods made with hydrogenated or partially hydrogenated oils and fats such as margarine. Trans fats are the worst type of fatty acids and should be avoided where ever possible as they are known to increase cholesterol in your blood. Saturated Fats: Saturated fats have no double bonds in their chemical structure and are solid consistency at room temperature. Saturated fats contribute to high levels of cholesterol in the blood. They can be found in palm oil, butter and should be limited. Coconut oil is an exception to this. Monosaturated Fats (MUFAs): MUFA’s have only one double bond in its structure and is known as omega-9 fatty acids or oleic acid. MUFA’s improve cholesterol levels and reduce the risk of heart disease. They can be found in olive and nut oils. Polyunsaturated Fats (PUFAs): PUFAs contain two or more double bonds in their structure and consist of omega-3 acids and omega-6 acids. They are known as essential fatty acids and are extremely important to your health. Omega 3, in particular maintains healthy cholesterol, vital for brain function, helps lower risk of chronic and cardiovascular diseases, lowers blood pressure and decreases inflammation. You can find a table of omega 3 fatty acid ratios and smoke points of popular oils here. Nutritional and food labels can be found on the front, back or side of the packaging. 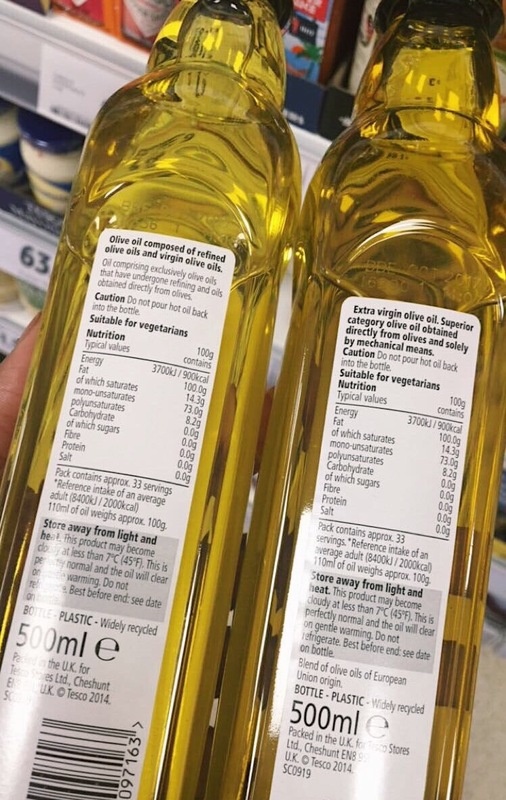 This will display essential information about how to correctly store oils, main uses, ingredient lists and nutritional information such as breakdown of the fatty acids, alongside the reference intake. This will help you make informed choices. Let’s look at the Oil guide. What is it made from and how is it made ? Most coconut oils are made by either sun drying, smoke drying or kiln drying the dried kernel (meat) of a coconut also known as ‘copra’. Then the oil produced from the copra can be extracted by various methods such as cold pressing and expeller-pressing. It is high in natural healthy saturated fats known as medium-chain fatty acids (MCFAs); caprylic acid, lauric acid and capric acid. Helps you lose weight by reducing appetite and increasing fat burning. It is processed by the liver, which means that they are immediately converted to energy instead of being stored as fat. Increases metabolism and thyroid function. 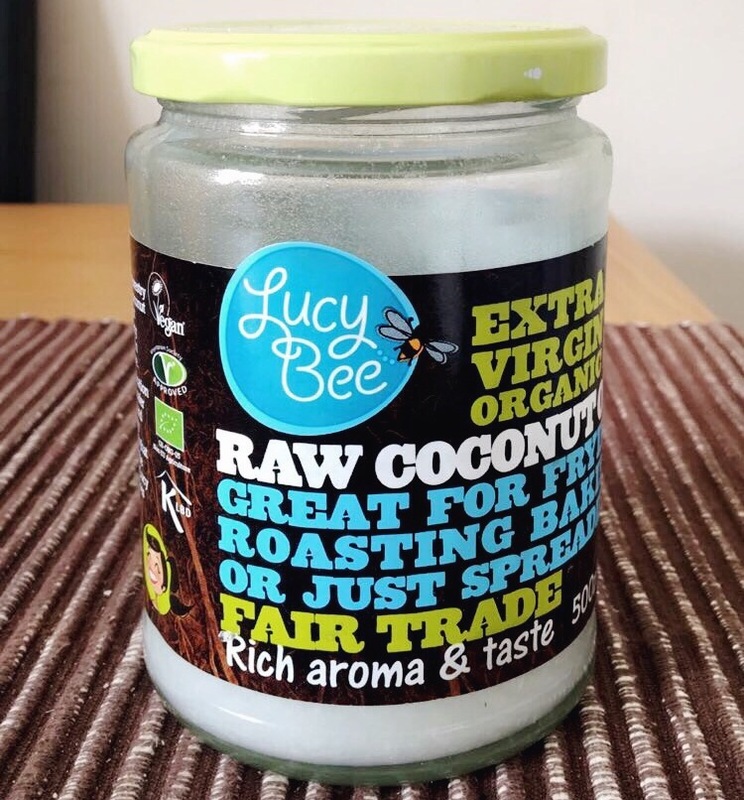 There are high levels of antioxidants present in virgin coconut oil which helps to reduce inflammation. Provides increased resistance to viruses and bacteria due to MCFAs in coconut oil. Lauric acid found in coconut oil can improve blood cholesterol levels. 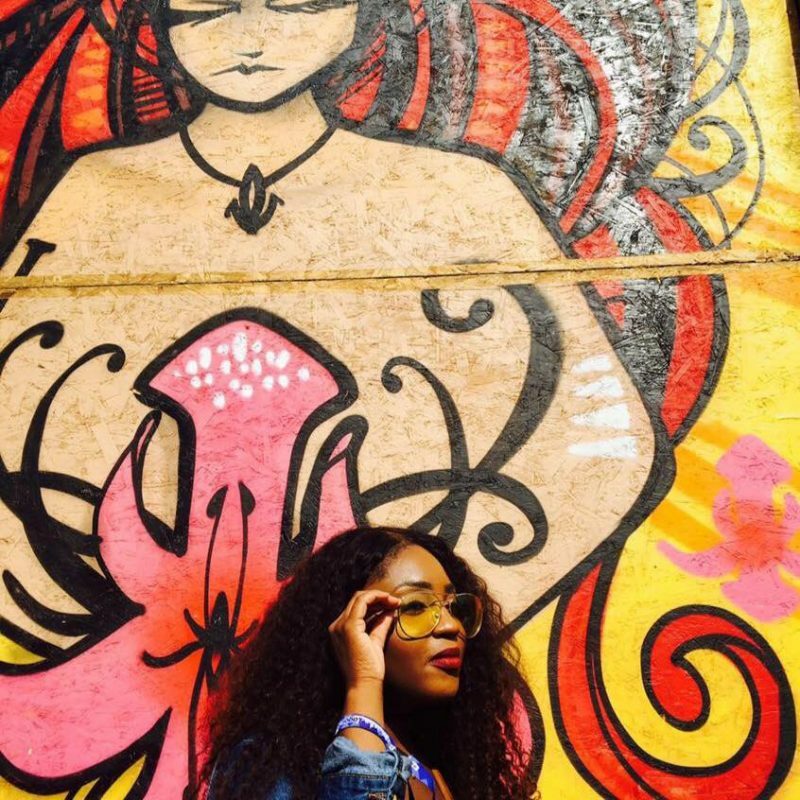 Coconut oil can protect hair against damage and can serve well as a sunscreen. It also It also has fantastic moisturising benefits to our skin and hair. What is coconut oil best and worst for ? Coconut oil is great for all-purpose cooking such as, pan-frying, frying, sautéing, baking and cooking at high heat as the smoke point of coconut oil is 177°C which is relatively high. It’s worse for drizzling over food as a dressing because at room temperature, coconut oil is a solid. Olive Oil is a blend of refined olive oil and virgin olive oil (obtained directly from olives). Extracting the oil from the olives comprises of 3 main stages; the crushing stage, the kneading or mixing stage and the extraction stage. 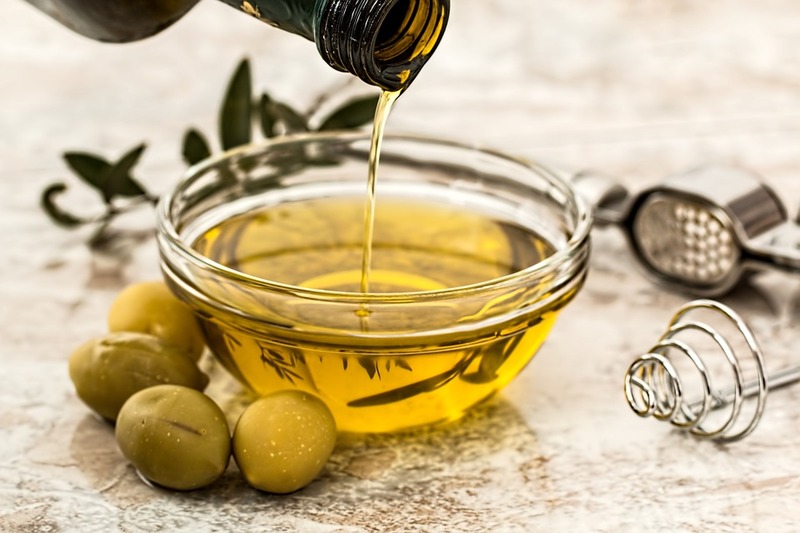 The refined olive oil undergoes additional chemical and/or heat processes of extracting the oil to adjust acidity, remove bad odours and flavours. Longer shelf life than the virgin and extra virgin olive oil. Comprises of 75% monounsaturated fatty acids (MUFAs), which is considered a healthy fat associated with lowering your risk of heart disease. Contains antioxidants like vitamin E and beta-carotene which help supports our blood vessels. What is olive oil best and worst for ? Olive oil is relatively heat-stable for sautéing, baking, salad dressings, grilling and roasting. If you’re using olive oil for cooking, keep your heat level in mind. However, deep-frying with olive oil should be avoided. This is the highest quality of olive oil and is extracted directly from olives through a process known as cold pressing. This means the oil is removed using only pressure and does not require chemical and heat processes. Contains a substance called oleocanthal which has excellent anti-inflammatory substances. It’s higher in antioxidants than olive oil. Extra virgin olive oil helps with anti-ageing and skin damage. Intake of extra virgin olive oil is associated with decreased risk of heart disease. Comprises of many nutrients such as vitamin E and K, omegas 3, 6 and 9 and essential fatty acids known to reduce cholesterol and maintain heart health, joint mobility and brain function. Extra virgin olive oil has been shown to help lower total cholesterol by helping to reduce LDL cholesterol and triglycerides. What is extra virgin olive oil best and worst for ? Extra virgin olive oil does not take well to high temperature cooking like frying because it has a lower smoke point than olive oil. This can lead to loss of important nutrients as the fatty acids can oxidise. It is best used for salad dressing and drizzling over your hot and cold dishes. Seed and vegetable oils include; corn, safflower, soybean, cottonseed, sesame, grapeseed, canola, rapeseed, flax-seed, rice bran, palm vegetable and sunflower oil. What are they made from and how are they made ? Sunflower oil is a common cooking oil pressed from sunflower seeds. Vegetable oil are a mix blend of oils extracted from seeds like soybean, corn, sunflower and safflower. Sesame oil are obtained from sesame seeds. Rapeseed are cold pressed or extracted from rapeseeds. Palm oil is made from the fruit of the oil palm tree. 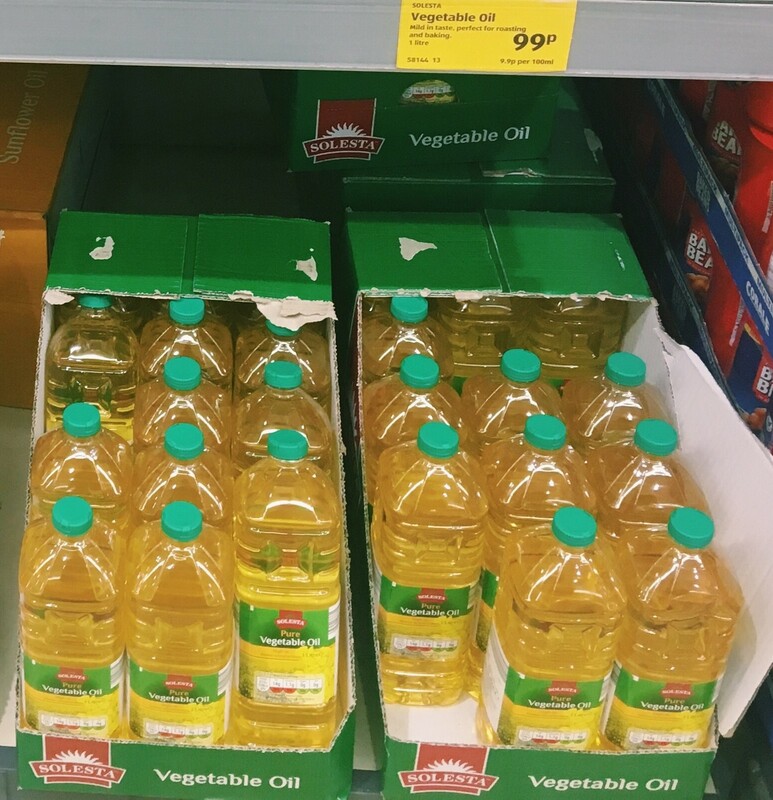 Most seed and vegetable oils are extracted using a process that includes both pressing the ground seeds and then extracting the remaining oil using a volatile hydrocarbon. The most common volatile hydrocarbon used in industry is hexane. This is called the the solvent extraction process. I have personally seen refined rapeseed and vegetable oil manufactured in industry and it’s really not a pretty sight! Trace amounts of hexane have sometimes been found in these oils. 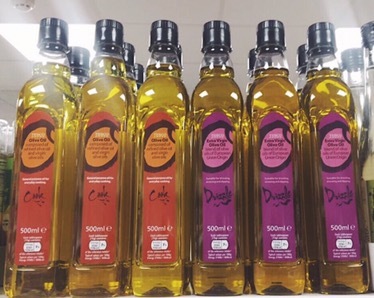 After extraction, most vegetable oils undergo further refining such as heating, bleaching and deodorising to produce a final product that is light, almost clear and odourless. Sunflower oil and rapeseed oil are rich in vitamin E, which acts as an antioxidant in the body. Refinement of vegetable oils ensures that the final product is stable in high heat and has a longer shelf life. Why you should minimise use or avoid altogether ? Some vegetable oils undergo an additional process called hydrogenation and trans fats are added. These fats are highly toxic and are associated with an increased risk of various diseases, like heart disease, obesity and diabetes. Vegetable oils contain a very high concentration of Omega 6 fatty acids and polyunsaturated fats. What can seed and vegetable oils be used for ? Most of these oils have a very high smoking points. This means these oils can be used for all-purpose cooking such as roasting, baking, marinades, frying and deep-frying. Nut oils include; almond oil, cashew oil, avocado oil, hazelnut oil, walnut oil, macadamia oil and brazil nut oil. Almond oil is made by pressing the oil out of ground almond paste. Avocado oils are pressed from the fleshy pulp surrounding the avocado pip. Nut oils are normally crushed and the oil is separated using a screw press process. Almond, hazelnut and avocado oils are high in monounsaturated fats and vitamin E (great for skin and hair). Avocado oil contains lutein, an antioxidant that improves eye health. Nut-based oils are low in saturated fats. Walnut oil contains a substantial amount of omega-3. What are nut oils best and worst for ? They are ideal for salad dressings, baking, drizzling, adding nutty flavours to dishes and worst for frying.